Manually Operated End Type System | Overview | Daikin Lubrication Products & Engineering Co., Ltd.
• Simple system with low equipment expenditure. • Suited to medium-scale machinery with long lubrication intervals. • Efficient lubrication by combining with other lubricating systems. • Simple operation with easy oil supply. 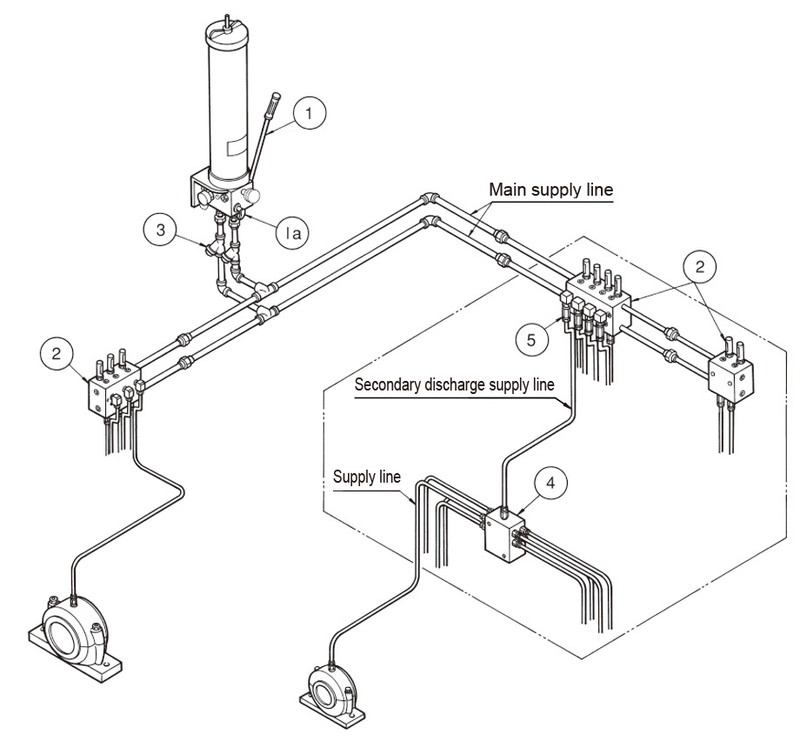 Lubricant transported from the pump (1) is supplied to one of the two main supply lines depending on the position of the change over valve (1a), and the rest is released to the tank. 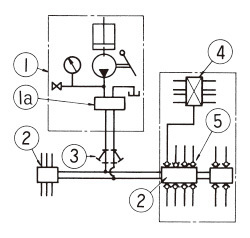 When all distributing valves (2) finish operating, the pressure of the main supply line suddenly rises to indicate that lubrication is completed. The next lubrication operation is performed with the pressure feed and open main supply lines reversed due to the change over valve (1a) being set to the opposite position. Be sure to check a sudden pressure rise as it will be a guide to judge whether lubrication is completed or not. Note) A progressive system (indicated inside two-dot chain line) is also possible as shown in the diagram. In this case, install a check valve (5) to the discharging port of the 1st distributing valve (2). DV-30 to 60 type can also be used. DV-50 to 60 type can also be used.